SSC-Pacific’s MEMS accelerometer uses a novel electro-optical method of measuring acceleration, resulting in higher sensitivity and lower noise. 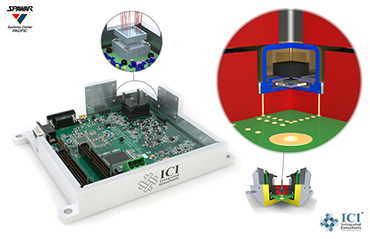 ICI developed an electronic control board to operate the accelerometer. The board first characterizes the unit, then, during operation, it runs the device and interprets the output. An on board FPGA allows dynamic configuration changes to the MEMS output interpretation. Custom mechanical mounting of the MEMS device assures signal integrity. A precision mounting plate assures rigidity and accurate axis references.